EMPOWER YOUR BUSINESS - Throw away your old calculators. Transform everyday calculations. 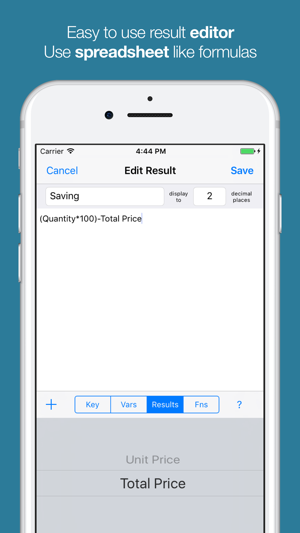 Create calculators for your business right on your iPhone or iPad. 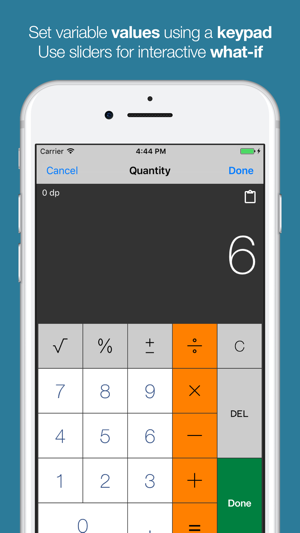 Create your own calculator apps right on your iPhone or iPad. In minutes your business specific calculations become a breeze. Create a calculator for each type of problem you need to solve using formula similar to those found in spreadsheets. "It turned into a mission-critical app when I created a set of formulas for all my estimating and billing." "I own a Retail store and have to work out margins every day." "I use this app nearly every day for scuba gas blending. It saves a huge amount of time." "I have several elaborate pricing formulas that I use at work. ... 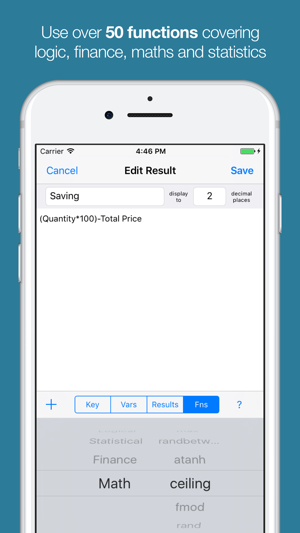 I can quickly adjust two simple numbers, my price and my markup ... and give me a suggested price." "I created several functions that make it easier to interpret logistic regression results, and it works like a charm!" "I work in the Road Construction industry and have not found anything close to this app." "This app has made my job so much easier and almost fun." 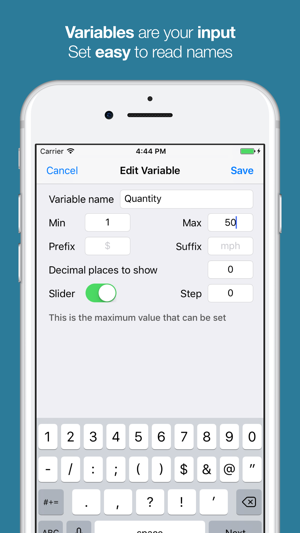 Go Calc allows you to quickly create new calculations by setting up variables and formulas on your iPhone or iPad. Each calculator you create can be reused again and again. Calculators can be easily found by filing them into categories. Formulas in Go Calc share much with the formulas you write in your favorite spreadsheet. Over 50 functions can be used including IF, MAX, SIN, LOG, IPMT, RANDBETWEEN. Import and export your calculations. Backup all your calculations easily and without the need to install any software on your PC or Mac. 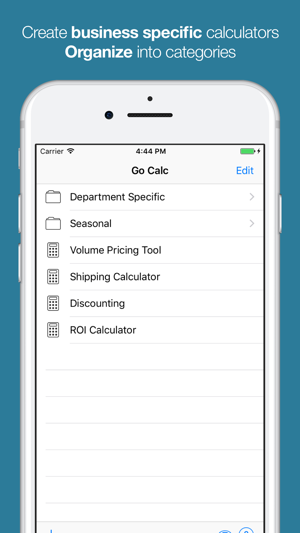 Create calculators and then share them with other Go Calc users in your business. This releases fixes some issues for users on iOS 10. Thank you for your patience with any issues you may have experienced. If you have a story as to how you use Go Calc I would love to hear it - use the support link and get in touch! Every time there’s an IOS update, I have a few apps that have been abandoned by developers and won’t work with the new OS. Most I wouldn’t care about or could easily replace — but not GoCalc. I’m always relieved when it still works, because I use it nearly every day. Still awesome. I started simple, adding cooking conversions I use a lot. Then I added a few design conversions. But it turned into a mission-critical app when I created a set of formulas for all my estimating and billing. I'm not good at math, but by using the built-in apps as examples, and a little trial and error, I got them all working. Saves HOURS on these time-consuming tasks! Love being able to email the results to save with the paperwork. Would give it 5 stars if you had the option to clear all variables at once, and if you could duplicate an entire calculation to use as a base for a new one. Love the app. Please update. I have been using this app for years. Use for work on a weekly basis. The last update seem to have created an issue. I can no longer edit a formula because the top header bar cover the equations. This also stops me from creating new calculators. Please update correcting this issue. Using 1st gen iPad mini. I would easily give this app 5 stars if I could edit and create calculators again. Please fix and thank you! Go Calc is not functional as the "Cancel Edit Save" Banner covers up formulas and fields making the Go Calc unusable.